“I’ll be back in about a half hour,” I told Emily as I passed. I later noted, but didn’t voice, how Emily wasn’t alarmed when I hadn’t returned two hours later. I turned right on Folley Field and started a brisk run. It felt good. I was exercising on vacation, when it is toughest to maintain fitness. The sky was clear and sunny, the temperature about 75 degrees. I smiled and waved at passing runners, walkers and bikers. Running with the perception of a nearby beach is pleasant. Less than 10 minutes later, I reached an intersection. Turning back would mean only 20 minutes of fitness, and because I was experiencing the rare desire to continue running, I opted to turn right, still following the bike path. I would, of course, take another right and then another right to return to the condo via Folley Field. The plan was simple, even for a malformed mental compass. Just a few minutes later, I’d reached William Hilton Parkway, the island’s main drag. I simply turned right as the bike path snaked through shallow woods and around Carrabba’s restaurant. 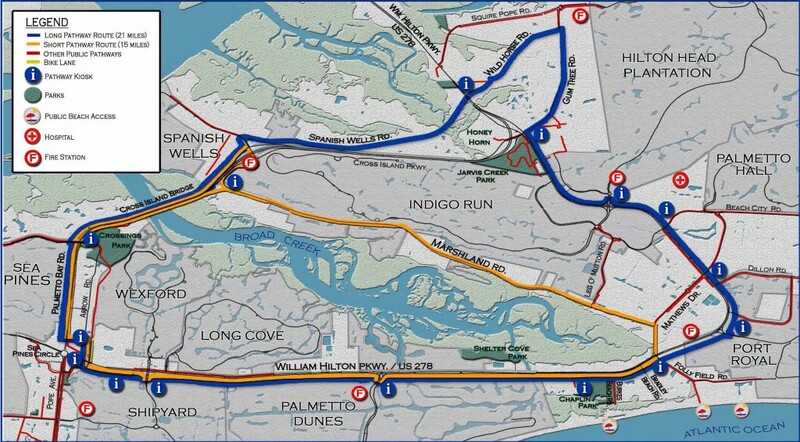 According to Hilton Head maps, I then ran by Folley Field Road. I didn’t notice the sign. But that’s what I did. I few minutes later, I surmise, I started wondering why I hadn’t yet spotted Folley Field. Maybe, I thought, Folley Field didn’t directly intersect with the Parkway. It does, but I wasn’t thinking much about it. I was thinking about this great workout and listening to my iPod mix of upbeat, party tunes. Besides, I could just turn right into the Port Royal main entrance and complete the circle. That would require a little more than a half hour, but what’s a few minutes more? The right earbud – I don’t understand it. Why does it fall out every 30 yards when the left remains securely in place? Surely both ears are equally sweaty. Is it because the iPod is in my right pocket, creating more pull on the right bud? I switched the iPod to my left pocket. Nope, the damned right still slipped out. So, I was mildly annoyed when I reached the ominously named Union Cemetery Road and cut right. I was mostly walking at this point. I sensed an elbow in the road was leading me further away from the condo’s vicinity, but still, my overheating brain maintained, I would surely hit Folley Field, or some connecting avenue, eventually. A little after 10 a.m., Union Cemetery ended at Dillon Road. Dillon Road? This was the first road of which I had no concept. Also, this was the first instance of me thinking, “I made a bad decision.” I wasn’t sure when the bad decision occurred, but I sensed the vague aftermath of a bad decision. I was walking past trailers and yards of dirt rather than lush, green grass. In each yard was a pair of chained dogs. These weren’t pure-breeds. These dogs had jackals and foxes in their lineage. They were barking, snarling and lunging. A stereo in the distance was playing Latin music. The help? Like that movie? Jeff’s remark made me think of “Downton Abbey,” of how I might have, if asked, explained “the help” descended into underground quarters each night, returning at first light to spray down the sidewalks. But no, they lived along the hellscape known as Dillon Road. Eventually, I was looking at Beach City Road. A kiosk was posted at the intersection. The kiosk contained a framed map of the bike path, complete with a “You Are Here” arrow. I’m ashamed to mention I’d passed about 10 of these kiosks before actually stopping to read this one. I would have to turn onto Beach City and, about a mile down, start looking for Matthews Drive. At this point, I was walking only. Then, about a quarter-mile down Beach City, I decided to make this excursion a “super-workout” and run at least half the return. After about 30 yards of doing this, a sharp pain stabbed the bottom of my foot. The previous day, I’d rolled my ankle merely walking on the beach. The injury had returned as some sort of tendon pull, the pain stretching from the top of my ankle to the arch. The resulting limp caused a mild knee sprain and hip pointer, both within a 20-yard stretch. Without a phone, I was all alone, struggling to return to Port Royal. Well, not really. Hilton Head is a popular vacation destination, so I was passing lots of pedestrians and vehicles. I was right in the middle of civilization. I passed a shopping plaza, a doctor’s office and a CVS Pharmacy, as well as a gas station and Bi-Lo. I could have stopped at one of these places to call my wife’s phone, but I was determined to get back without help. Having to call for help – again, in the middle of popular vacation spot, on a highly-populated island – would be much, much worse than limping in pain for a few miles. For me, it would be in the same category as getting lost in Target. So, I marched on. Thinking about my wife made me wonder if my friends and family were worried about me. I had been gone for an hour and a half, after all. It was before noon, however, which meant they either were asleep or slowly getting drunk – respectively. No one was thinking about me. I wasn’t offended, just recognizing reality. I spotted Matthews Drive on the opposite side of a roundabout, which is a running joke among highway engineers. I examined the readily available kiosk to be sure I wasn’t headed to Savannah then ran, with pain shooting through my leg, to the roundabout’s center. Another sprint, and I was on Matthews. I was still on the bike path, still passing joggers and bikers. I was no longer, however, waving and smiling. I was, I’m sure, scowling. “What are you smiling about?” I was thinking. Evil visions of them flipping over handlebars and into traffic were coursing through my mind. I would throw a stick in that guy’s spokes and steal his bike. That’s what I was thinking as stumbled down the bike path like a zombie – a zombie with arthritis. Matthews led to the Parkway, and I turned left. Dark clouds were gathering in the sky, and a woman, her baby in a stroller, had stopped beneath a tree, presumably because she was sensing rain. “Excuse me,” she said. English was not her primary language. I guessed she was Sweedish, but she might have been French. And ironically, she was about to ask me how to get somewhere. “Sir? Excuse me.” I looked at her, and the right bud tumbled from my ear. I’m sure she wondered how I could do that. Just remove an earbud with thought, without using my hand. It probably was some useless, vain technology Americans had spent millions to develop instead of investing in cures. “I am trying to find Bi-Lo,” she added. I can help you! Unbelievably, I can help you! I pointed to where I’d been. “It’s just a quarter-mile that way!” She seemed wary of how happy I was to know the location of Matthews Drive – and also of how I was drenched in sweat even though I was just walking very slowly. I finally reached the Port Royal entrance, the very one I’d passed an hour before, and turned left. About 15 minutes later, just after 11 a.m., I was approaching the condo. The sun had retaken the sky. My wife, Michelle, and Jordan were outside preparing for a beach trip. I could tell, just by how Michelle was looking at me, she recognized I’d made some sort of serious error, so early in the day, and that error had led to my palpable limping. But she didn’t ask about it. She smirked and went to the beach. I returned to the room. Julie was there. “I took a wrong turn,” I told her. That sufficed. Because that would have been so much worse.